This recipe is sponsored by Coffee-mate, but the opinions are completely my own based on my experience. Do you love frozen coffee, but don’t love the price tag that comes with it? I can empathize with you—I love them and find myself running through the drive thru all too often. However, on days that I’m at home and not planning to going out I make my own at home. The same great flavor for a fraction of the price! 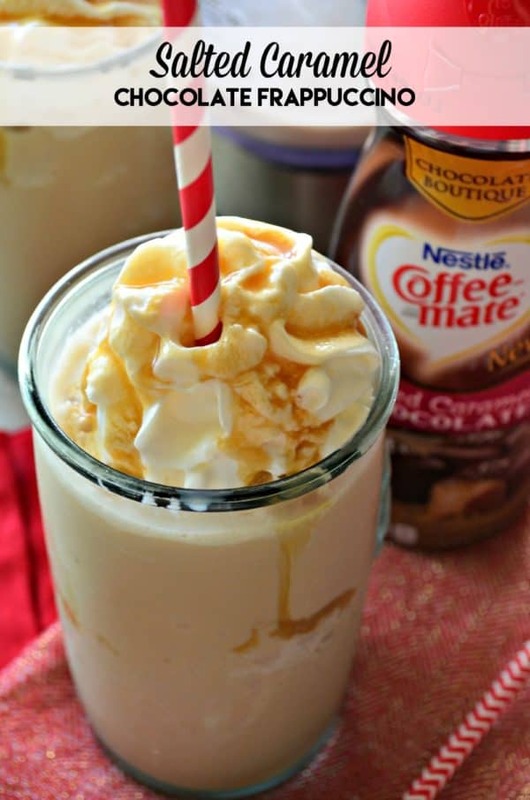 What makes this frap taste just as good as the in-store one (if not better) is using Coffee-mate Chocolate Boutique Salted Caramel Chocolate Creamer. You get a two for one with both cream and the decadent salted caramel chocolate flavor. With just 5 ingredients (ice included) you can make a frap at home. 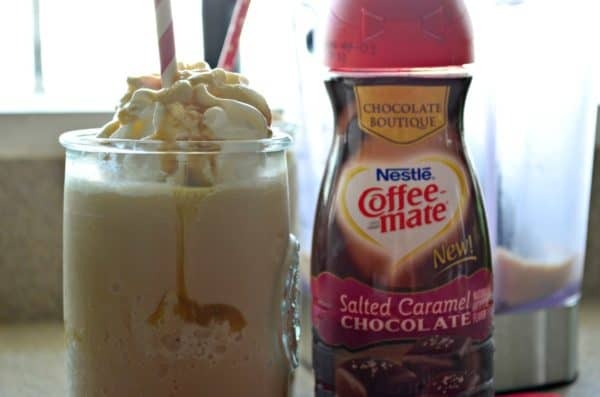 All you need is Coffee-mate Chocolate Boutique Salted Caramel Chocolate Creamer, freshly brewed (strong) coffee that has been chilled, caramel sauce (optional if you want it sweeter), and ice. Blend it up and voila! You have yourself a salted caramel chocolate frozen coffee. Then to really amp it up you top it with whipped cream and a drizzle of caramel sauce. 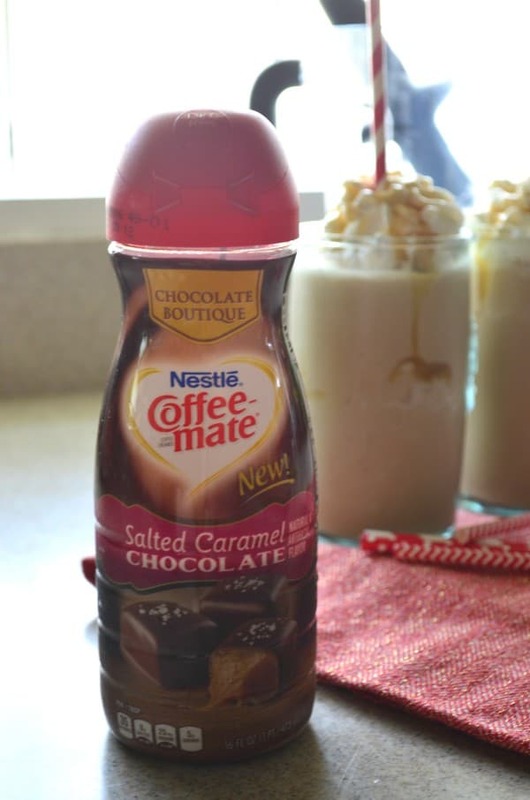 If you haven’t seen it yet in the stores, Chocolate Boutique is a brand new line of Coffee-mate creamers in 2016 and each flavor is carefully created to be decadent and delicious because chocolate and coffee go so well together. The Chocolate Boutique collection is made up of three delicious flavors: Salted Caramel Chocolate, Chocolate Toffee Truffle and Café Mocha. Did you know that if you add a little xanthan gum (it’s a food thickener) it will keep blended drinks from separating? I actually didn’t have any on hand when I made these and to be honest, I’m ok with the separation. But if your not and want your at home frap to be silky smooth add in a little xanthan gum. Just a little fun fact I wanted to share in case you were wondering why it comes out in two parts from the blender! 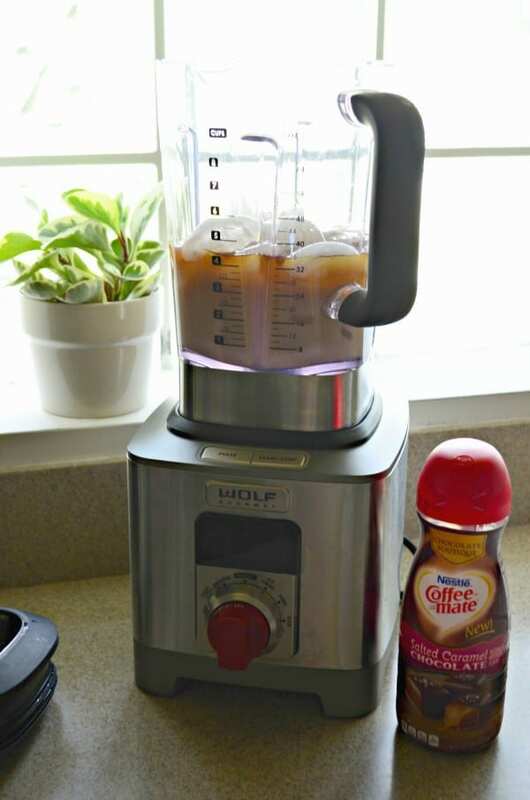 So if you love getting your frozen coffee fix–you have to try my recipe for an at home iced Salted Caramel Chocolate coffee! Make sure you visit Coffee-mate to find the flavors at a store near you, and get social with them on Instagram, Twitter, and Facebook. Let me know which new Coffee-mate Chocolate Boutique flavor you love! 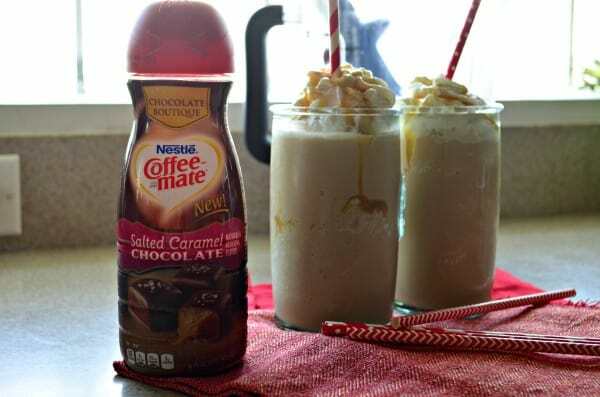 In a blender combine the brewed coffee, Coffee-mate Salted Caramel Chocolate Creamer, caramel sauce (if you want it sweeter) and ice. Blend on a smoothie setting for 45 seconds. Remove from the blender and divide evenly among two glasses. Top with whipped cream and caramel sauce. Drink immediately. 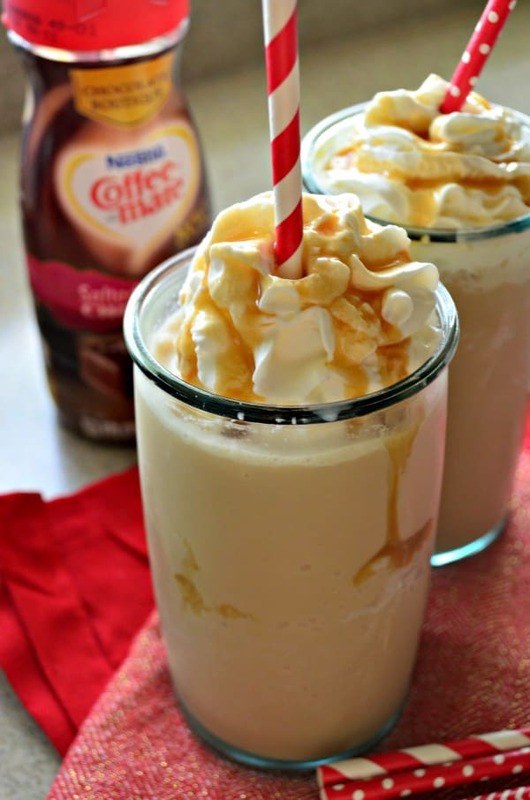 *If you like your drinks on the sweet side add in the caramel sauce before blending.